BF-UV-7R two-way radio is the newly developed by BAOFENG recently, it is a dual band two-way radio, its performances is stable, it is solid and durable. Its creativity and reliability make it a much more potential transceiver. 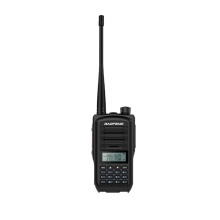 *Frequency Range: VHF136-174 / UHF400-470(MHz), Dual Channels Watch, Dual Band. Up to 128 memory channels. With voice prompt. *CTCSS/DCS: The unique CTCSS/DCS encoding & decoding function can avoid listening to the same channel on the irrelevant call. *Flashlight lighting: Practical flashlight function, to solve the emergency needs in the dark environment. *1800mAh Long Standby Time: Battery saving, low battery warning, high/low power switchover. With earphone. *FM Radio(FM85-108MHz). Different frequency transceivers, and it can be set up to connect with relay stations.